← Green Spring Cleaning with Natural Products Review – Does it Work? Cooking Freezer Meals Review – Is it Worth it? Supermarkets are full of frozen “convenience food”: ready to cook meals that are full of sodium and other unwanted ingredients. Doing your own cooking for the freezer can be a great way to stockpile wholesome food for quick meal time preparation. But is the extra time and effort up front worth it? Having a freezer full of prepared meals can be a great resource after the arrival of a new baby, during a house move, when hosting out of town guests, or any other time convenience meals are required. Requires extra effort up front to prepare and package meals. Some dishes change a little bit in texture after cooking, freezing and re-heating. Freezer with chili, chicken and rice casserole, macaroni and cheese, quesadillas, apple pancakes, proscuitto wrapped chicken, oatmeal cookies, and lasagna. All ready to heat and serve. I was first introduced to the concept of freezing home-cooked meals for later by a friend with a new baby. She mentioned that her social group had been very generous in bringing by home-cooked meals each day – it had been more than they could eat. So she froze half of each meal to re-heat later, effectively doubling the number of meals she didn’t need to cook with a newborn in the house. At the time, I had never heard of home cooked frozen meals, but I thought it was genius! Around the same time, I tried out a cooking place called “Let’s Dish”. This was essentially a do-it-yourself meal kit kitchen. They did all the prep work for you – cutting and measuring. You assembled the meal into freezer bags and aluminum pans. Each meal stayed frozen until time to eat, and then just needed a bake in the oven, or quick stir on the stove top. (Other companies that sell this same type of product are “Super Suppers” and “Dream Dinners”). While pricey, the cost per meal was still much less than eating out, and the convenience was a great help to my nightly what’s for dinner tonight rummage. While I hadn’t started weekly meal planning yet, I was always on the lookout to make my life easier when it came to getting a good wholesome meal on the table. Freezing home cooked meals was a great solution. I learned that if I just made a little more of the dinner time meal, I could freeze another full meal’s worth for another day. This was much better than have a single serving become a leftover that no one wanted. Frozen meals can easily be reheated by microwave, stove top or oven, depending on your preference. There are two different strategies for filling your freezer with wholesome meals that can be quickly cooked and served. The first is to make extra whenever you cook a meal, and slowly squirrel away an extra meal here or there. This is my preferred strategy as I feel like I am not doing any additional work. Making a large pan of macaroni and cheese takes me the same amount of time as making a small pan, but I get two or three meals out of it. With this strategy and careful meal planning, I find I only have to cook a full meal from scratch twice a week, yet we are still eating a wholesome home cooked meal every night of the week. The other strategy for tackling freezer cooking is to do “weekend” cooking. That is, you set aside a whole day to assemble and cook large batches of many meals. If done correctly, you can fill up your entire freezer with a month’s worth of dinners. I have a good friend who has found this strategy great for her family. She often does a Saturday cook day with another woman to split the cost, split the meals, and share the work. I do not prefer this strategy mainly because, as a full-time working mom, my weekends are too precious to spend a whole day cooking (and away from my kids). Many different kinds of meals can be prepared for freezing. Some meals are cooked before freezing, others simply assembled for a meal that will require full cooking later. I find that most casseroles can be frozen fully cooked, and just require a re-heat later. 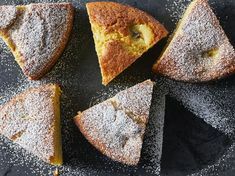 Baked goods like muffins and pancakes should be baked first, then thawed gently. Many meats can be prepped, and frozen for cooking later (i.e. skirt steak sliced and frozen in marinade). Some dishes are perfect for assembling prior to freezing and the fully cooking later, like lasagna or quesadillas. I’ve found a great guide to freezer cooking here. While homemade freezer meals can be quick and convenient, some pre-planning may be necessary. You need to plan extra cooking into your mean or meal plan. Depending on the frozen meal planned, some thaw time may be required, or side dishes prepared separately. Overall, I’ve found freezer cooking to be the key to getting a home cooked meal on the table for my family every day. This is not something that is easy to do while working full time. For me, however, the extra work up front is well worth the minutes saved come dinner time! How about you? Do you freeze home cooked meals for another day? What’s your favorite homemade freezer meal? Please share your strategies below! This entry was posted in Real Food and tagged better for the earth, better for you, homemade, kitchen, real food, saves money, saves time. Bookmark the permalink. 21 Responses to Cooking Freezer Meals Review – Is it Worth it? I have been having this debate with myself lately!! I do like being able to pull a meal out quickly or have it in the crockpot all day, but I have a hard time spending a whole day getting everything ready to go. Hi Mandy! I can’t do a whole day of cooking either, which is why I just make a BIG batch of food whenever I cook. I can freeze a meal of two without doing much extra work at all! I used to cook a lot of soups and such to freeze for my husband to take to work, but I don’t have the time to devote to it, now when I try to double/triple recipes in order to freeze some for later, I still never have much left. I think I need to readjust my thinking and recipes to realize that we are now a family of 7 with 4 growing boys with big appetites….then maybe I will have left overs to freeze! Sarah, my kids are still small, so they don’t eat a lot, but I’ve been thinking that I may have to readjust my strategy when they get bigger as well! I am soooooooooo impressed by people such as yourself who do this! I struggle to prepare one meal a day (husband goes to work early….doesn’t eat breakfast….takes a lunch which is made up of leftovers from the previous evening meal). There are just two of us now, and I really dislike cooking. Wouldn’t you know it? I now have the time (retired from teaching, children long-gone) but not the inclination. Hi Evelyn! I love cooking, so maybe that makes it easier for me. When the garden is in season and I’m making a lot of veggie casseroles, I frequently make double so I can freeze one. Mmmmmm – what kind of veggie casseroles do you make? Yes Jenni! I did a weekend cooking day with a friend once and it was a lot of fun to work together all day. I tend to make extra and freeze that, too. The thought of contributing an entire day to cooking overwhelms me! Good for you for making wholesome meals for your family while you work full-time! Glad to hear the same strategy works for you too Laura! Thanks for your kind encouragement 🙂 Being a working mama is not easy. My freezer is how I always feed myself lunches throughout the work week. I do think it’s the way to go! 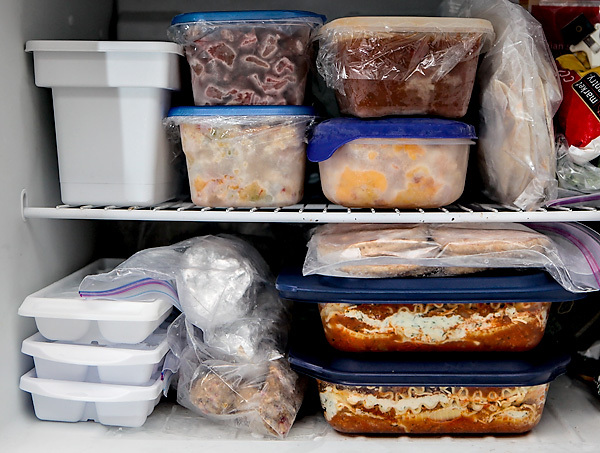 Frozen lunches for work – that’s a great idea I hadn’t thought of yet. Thanks Teresa! A few months ago my husband hit a bump in his job. He works in sales and is paid solely on commission. We had 2 months of little or no income, but having food in the freezer saved us. We were able to live almost entirely off of what we had in the freezer and the cupboard. It was a huge blessing, and I am now a huge advocate for freezing meals. Even if it’s just freezing leftovers, it helps. Regina, what a blessing those meals must have been! I hadn’t thought of it, but a freezer full of prepared meals is absolutely a certain kind of insurance. I hope things are looking up for your family again. I usually do the double batch cooking. Cook one and freeze one. My favorites are lasagna and pot pies. Lasagna is one of my favorite freezer meals too!